This review has not yet been approved by the owner of this writing service. If you are the webmaster of E-custompapers.com, please Contact Us to approve or remove this review. This website sports an extremely annoying and intrusive system of registration, making simply checking the price of your potential order into a long ordeal consisting of several steps. There is no kind of price calculator you can use to see if you are ready to pay the service’s prices, or if there are any additional functions that may be available for extra fees – the only option open to you is to open an account, divulging your email, name and phone number, probably to get your phone and email bombarded with spam. There is something called a “Free inquiry” that is supposed to fulfill the function of a price calculator, but it doesn’t work as intended and tries to send you somewhere via an unsecure connection. Unfortunately, the site doesn’t present any information whatsoever about the prices offered by the company, and customer support proved to be impossible to reach to. Customer support is available by phone, email, fax and chat. Unfortunately, no amount of waiting proved enough to receive answers to our questions. No real student willing to place an order to complete an urgently needed assignment would wait this long – which means that the company simply doesn’t care what its potential customer think about it. There are several writing samples presented on the site, and all of them show a passable, if not in any way impressive, writing. Word usage is generally correct, here there are not many grammar mistakes, but the language mastery leaves much to be desired. You can choose the writer to work for you. 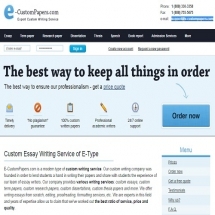 At a glance, E-CustomPapers.com looks exactly like dozens and probably hundreds other writing services you see online. Generic design, ungodly amounts of poorly written filler text, lots and lots of unnecessary pages and all the traditional attributes of such websites are present – but when you take a closer look, it turns out that the situation is even worse. Some vital information is simply missing – for example, it is impossible to estimate how much your order is going to cost without undergoing a lengthy and intrusive registration procedure. Useful info, if it is at all present, is lost among the sea of filler text. Some functions simply don’t work as intended or at all. In other words, E-CustomPapers.com is a service that doesn’t pay any attention either to its image or the comfort and convenience of its clients – and such approach is, mildly put, an unhealthy one.